Xilisoft Video Converter Ultimate for Mac converts virtually all audio and video formats. Options of batch-capturing movie screens are possible. Now you can convert multimedia files compatible with popular digital devices and transfer them to iPod, iPhone, and PSP directly. And it allows you to join/clip/split files, crop, add watermarks/soundtracks, and apply artistic effects before conversion. 2.Capable of inserting transitional effects in between merged video/picture items. 3.Makes the built-in player resizable. 4.Switches the zoom mode between 4:3 and 16:9. 6.Recognizes the picture formats of digital cameras; rotates and overturns pictures automatically according to EXIF parameters; manually rotates and overturns when editing merged picture item. 7.Support High-Definition video decoding and encoding: AVCHD, MKV, H.264/ AVC and much more HD videos. 8.Easily convert between video files (AVI, MPEG, WMV, DivX, MP4, H.264/ AVC, MOV, XviD, 3GP, FLV, etc. ); convert audio files from one to another (MP2, MP3, WMA, OGG, AAC, M4A, WAV, AC3, etc. ); extract audio from video. 9.Set a capture interval to extract pictures from video in batches. 10.Transfer the converted video/audio files directly to iPod/iPhone/PSP/iTunes. 11.Clip a file to pick up all the segments you favor and output them respectively or join them as a new one. 12.Set a split size or time length to split a large file into several parts. 13.Crop video image size to get rid of the unwanted parts. 14.Adjust the image brightness, saturation and contrast, and add artistic effects. 15.Multiple sound files can be added to your video. 16.Add more than one output formats to one source file, and then get them converted in a single click. 17.Specify the output file size you want with the Bitrate Calculator tool. 18.Much more adjustable profile parameters are provided. 19.Support multithreading and batch conversion. Xilisoft Video Converter Platinum for Mac converts all popular audio and video formats, captures movie screens. Now you can convert multimedia files compatible with popular digital devices and transfer them to iPod, iPhone, and PSP directly. And it allows you to join/clip/split files and do other video customizations to output files of your own. 1.Support High-Definition video decoding and encoding: AVCHD, MKV, H.264/ AVC and much more HD videos. 2.Easily convert between video files (AVI, MPEG, WMV, DivX, MP4, H.264/ AVC, MOV, XviD, 3GP, FLV, etc. ); convert audio files from one to another (MP2, MP3, WMA, OGG, AAC, M4A, WAV, AC3, etc. ); extract audio from video. 4.Capable of inserting transitional effects between merged video/picture items. 5.Makes the built-in player resizable. 6.Switches the zoom mode between 4:3 and 16:9. 7.Classifies the profile settings into different types. 8.Supports the input of the picture formats of digital camera,CD decoding. 9.Recognizes the picture formats of digital cameras; rotates and overturns pictures automatically according to EXIF parameters; manually rotates and overturns when editing merged picture item. 10.Set a capture interval to extract pictures from video in batches. 11.Transfer the converted video/audio files directly to iPod/iPhone/PSP/iTunes. 12.Clip a file to pick up all the segments you favor and output them respectively or join them as a new one. 13.Set a split size or time length to split a large file into several parts. 14.Add more than one output formats to one source file, and then get them converted in a single click. 15.Specify the output file size you want with the Bitrate Calculator tool. 16.Much more adjustable profile parameters are provided. 17.Support multithreading and batch conversion; convert files for Mac at super high speed. 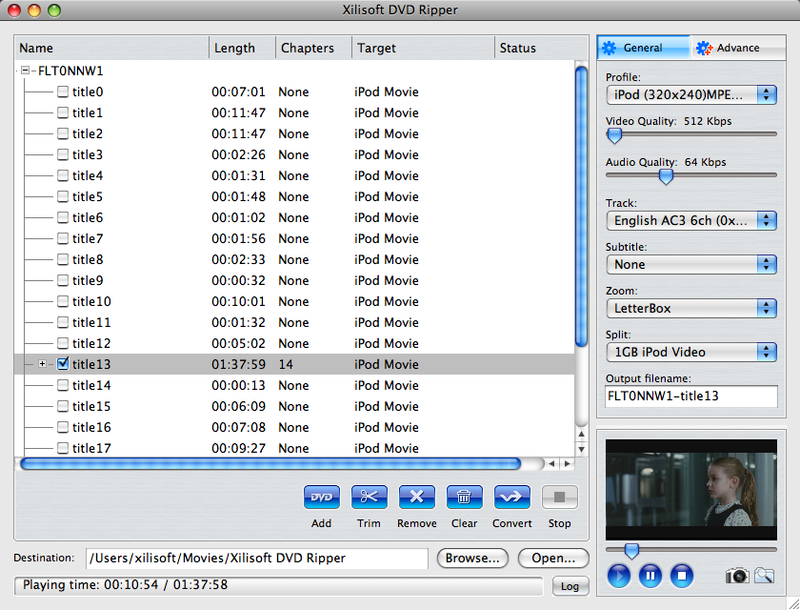 Xilisoft DVD Ripper for Mac is powerful, all-in-one DVD Ripping software designed for Mac users. It can easy and fast rip DVD to all popular video formats including AVI, MPEG, WMV, DivX, RM, MOV, 3GP, 3GP2, MP4, MP4 AVC, BlackBerry 3GP, BlackBerry AVI, BlackBerry MPEG-4 Video(*.mp4), etc., and rip DVD to audio formats such as MP3, WAV, WMA, AAC, AC3, M4A, OGG, RA, AU, BlackBerry AMR Audio, etc with super fast conversion speed. It provides an ideal solution to rip your DVD to video/audio files to play them on your iPod, iPod touch, 3GP phone, and mp4/mp3 player and so on. Besides powerful function, it provides versatile settings and features as well. 2. Provide >200% conversion speed, beyond your imagination; And speed is not limited, conversion speed increases with the improvement of your system. 8. It supports the edit function of ID3v1 and ID3v2 and permits you to edit music info for each file before rip DVD to MP3 or WMA. 9. All encoders and decoders are built-in. Xilisoft Corporation focuses on the users’ experience all along, offering the most easy-to-use software and consummate service. Xilisoft DVD Ripper is excellent DVD ripper software with amazing sound and picture quality, which helps you rip DVD to various video and audio formats like DivX, XviD, AVI, ASF, WMV, DVD-Video, DVD-VOB, Super VCD, Video CD, VOB MP2 PS, WMA, MP3. 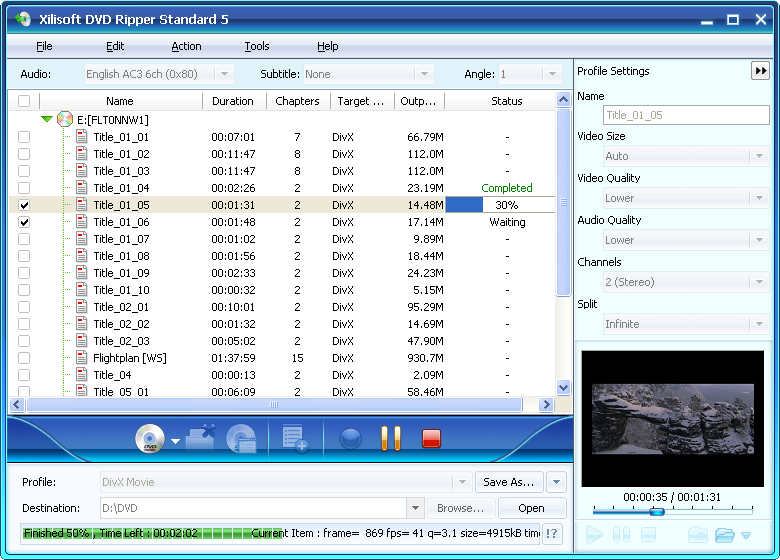 Multiple different formats are available in Xilisoft DVD Ripper. In addition, it’s optional for you to choose any chapter or segment to rip from DVD. You can also customize output file size as required, and create custom profile for future use. 2. Ripping DVD to various audio formats like MP3, WMA is also provided. 13. The output audio and video quality is so excellent beyond your imagination. 3.This converter lets you preview Blu-ray movie and capture screenshots easily. 4.You can enhance the brightness, contrast and saturation of the video pictures for better display effect. 5.Offers 4:3, 16:9, pan scan crop, etc. presets to tailor the video for screens of different resolutions and aspect ratios. 6.Lets you get desired length of the video for conversion with easy and precise control. You can put an image or a text to the output as a watermark with flexible styles. 7.Append subtitles from local path, add into the video and customize the output effect. 8.Auto-exit, shut down, stands by, hibernate the system or just leave it alone after tasks are done. 9.Available in English, German, Japanese, French and Chinese languages interfaces. < 1. In the new 3.1 version, besides the much friendlier interface, in function, a large number of new features have been added in. For example, it supports previewing, video trimming, video miniature, menu editing, setting actions after done. What's more, it can now support several types of DVD disc including D5, D9. Visit xilisoft.com to know more information. Xilisoft Video Converter Ultimate has the capabilities to convert all popular video formats from HD to HD, HD to SD and SD to SD, transform between audio formats, extract audios or pictures from videos. You can transfer the converted files to PSP, PS3, iPod, iPhone, Apple TV, Xbox and other digital devices for playback. 4.Capture pictures in batches from video. 8.Split a single file into several files by preset time or size. 9.Crop frame size; adjust brightness/saturation/contrast and add artistic effect; add watermarks. 10.Add multiple subtitle files and soundtracks of different languages in your video. 11.Lots of video, audio, tag and expert parameters are adjustable. 12.Select multiple output formats for one source file at one time and get them converted within one click. 13.Offer a Bitrate Calculator tool to customize the output file size exactly. 14.Run the software in the background. 15.Many product languages: English, Chinese, German, Japanese, Italian, Spanish and French. Xilisoft DVD Ripper Ultimate is powerful and easy-to-use DVD ripping software with the ability of ripping DVD to almost all video and audio formats, such as MPEG-4, AVI, DivX, Xvid, RM, FLV, SWF, MOV, 3GP, WMV, WMA, MP3, AAC, AC3, M4A, WAV etc. With its powerful compatibility for iPod, iPhone, PSP, Apple TV etc., Xilisoft DVD Ripper Ultimate enables you to rip DVD to many formats supported by various portable media players. Additionally, it can help you clip video segment, crop video size, edit video effects, adjust subtitle, and add video watermark, to get the customized DVD audio and video files. 12. The output audio and video quality is so excellent beyond your imagination. Xilisoft DVD Ripper Platinum is multifunctional DVD ripping software capable of ripping DVD to almost all video and audio formats, including MPEG-4, AVI, DivX, XviD, RM, FLV, SWF, MOV, 3GP, WMV, WMA, MP3, AAC, AC3, M4A, WAV etc. The powerful compatibility for iPod, iPhone, PSP, Apple TV etc. of Xilisoft DVD Ripper Platinum enables you to rip DVD to any format they supported easily. 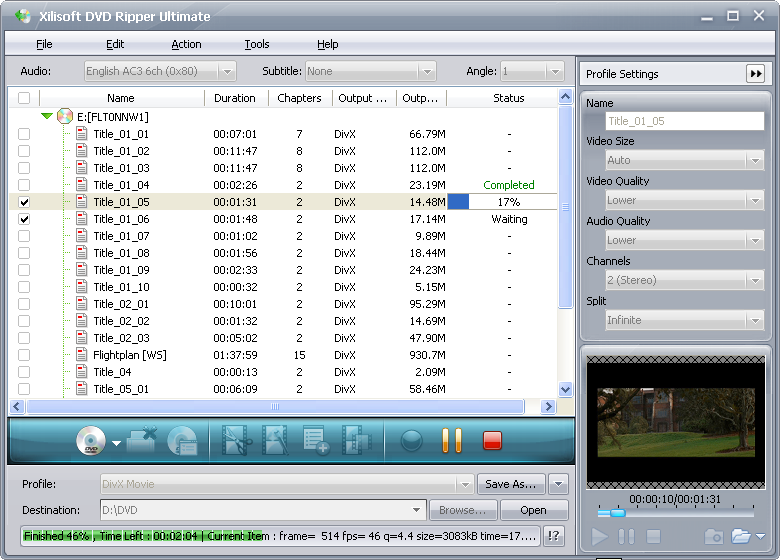 Additionally, you can choose any chapter or clip any segment to get custom DVD audio and video optionally. And customizing profile and output file size is also supported in Xilisoft DVD Ripper Platinum. 2. Help you get any audio files from DVD, like MP3, AAC, AC3, M4A, WAV, WMA etc. Free try Xilisoft DVD Ripper Platinum now and have a wonderful enjoyment on your converted movies! Xilisoft Corporation focuses on the users’ experience all along, offering the most easy-to-use software and consummate service. Xilisoft Video Converter Platinum can convert video files from HD to HD,HD to SD and SD to SD, transform between audio files,enabling you to transfer any video/audio files to PSP, PS3, iPod, iPhone, Apple TV, Xbox and other digital devices for playback. Lots of editing options are available for you to get custom files. 4.Video Converter6 is now powered with NVIDIA? CUDA? 5X faster in conversion time. 5.Enables the function of transferring the output files to iPod, iPhone and PSP. 6.Capable of inserting transitional effects between merged video/picture items. 7.Makes the built-in player resizable. 8.Switches the zoom mode between 4:3 and 16:9. 9.Classifies the profile settings into different types. 10.Supports the input of the picture formats of digital camera,CD decoding. 12.Set a capture interval to extract pictures from video in batches. 13.Transfer the converted video/audio files directly to iPod/iPhone/PSP/iTunes. 14.Clip a file to pick up all the segments you favor and output them respectively or join them as a new one. 15.Set a split size or time length to split a large file into several parts. 19.Support multithreading and batch conversion; convert files for Mac at super high speed.